With the federal government shutdown over, at least for now, there are some studies and surveys being done on the impact it had on the nation’s economy. A report released Monday by the Congressional Budget Office found that the U.S. economy took an $11 billion hit in the 35 days that parts of the government went unfunded. Rochester-based Paychex surveyed 300 business owners with 100 employees or less, and the company’s CEO Martin Mucci says 79 percent of them said they were not affected. For the 21 percent who were impacted, Mucci says it mainly involved businesses that need various kinds of government services. “They were impacted by things like the payment delay from government contractors so if they were a government contractor or working for a government contractor, those payments were delayed, they were not getting paid. You had the inability to apply for a small business loan through the SBA, through Small Business Administration,” Mucci told WXXI News. Also, Mucci says a number of small businesses in the Washington, D.C. area were affected by the shutdown. “You look at…restaurants, we saw a lot of restaurants and leisure and hospitality type businesses, around Washington quite impacted because people weren’t being paid in the government, therefore they weren’t going out to dinner, they weren’t out buying things,” Mucci said. 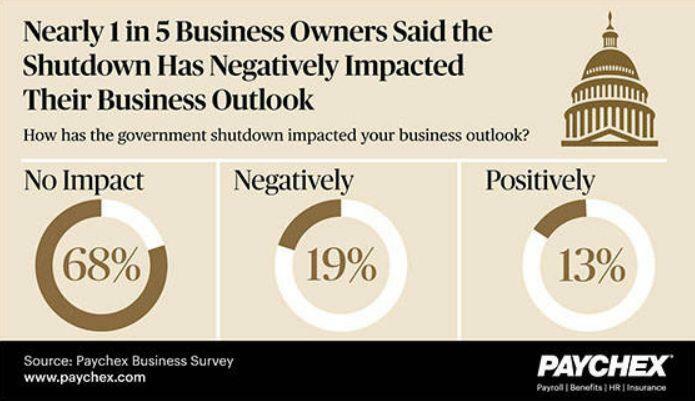 The Paychex survey also shows that despite the length of the shutdown, 68 percent of the business owners surveyed said that their feeling about how they will do in the near future was not affected.